Let everyone who comes to this place know they are on Aboriginal Land, the site of what was once Colebrook Training Home where, between 1943 and 1972, some 350 Aboriginal children lived, isolated from their families and the beloved land of their ancestors. This is part of the country of the Kaurna people whose heritage and presence continues today. Just days before, on 26 May, Bringing Them Home: Report of the National Inquiry into the Separation of Aboriginal and Torres Strait Islander Children from their Families had been tabled in the Australian Parliament. The report made explicit claims that the Government policies which separated Aboriginal children from their families constituted genocide. 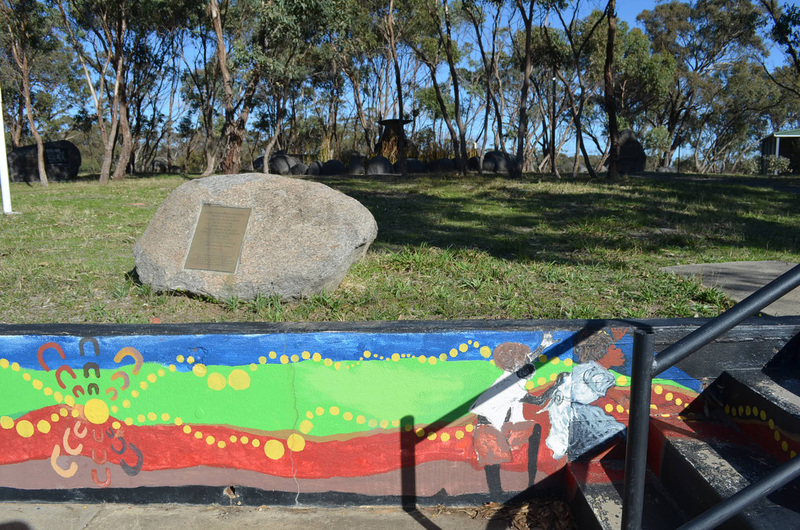 That simple plaque was the beginning of Australia’s first memorial to the Stolen Generations, the Colebrook Reconciliation Park. In the late 1990s there were nine formal memorials created in Australia to the Stolen Generations. It is tempting to see these memorials as developing out of Bringing Them Home. However, it is probably more accurate to say that the Human Rights and Equal Opportunities Commission (HREOC) inquiry which resulted in the report was part of a broader movement to recognise the history of separation of Aboriginal families in Australia. Certainly official, state-funded memory work opened up the space for this history to enter the mainstream public sphere. The 1991 Royal Commission into Aboriginal Deaths in Custody, which was an important part of the impetus for the HREOC inquiry, found that 43 of the 99 people whose deaths it had investigated had been part of what is now known as the Stolen Generations. The Hawke-Keating Government of the late 1980s and early 1990s began to respond to Aboriginal activism, establishing the Native Title Tribunal and declaring 1991–2001 the Decade of Reconciliation. The Colebrook Reconciliation Park has its genesis in a study circle developed out of that process. The circle began in 1994, led by American-Australian Di Dent and Ngarrindjeri leader Matt Rigney, and later formed the Blackwood Reconciliation Group (BRG). It was this group that initially decided to install a plaque to mark the location of the Colebrook Home. However, after the group made connections with ex-residents of Colebrook, it took almost two more years until the group were ready to install the plaque. Part of this time was spent forming a group of ex-residents known as the Tji Tji Tjuta (‘All the children’), which provided a mechanism that allowed decisions to be made in partnership with but also separately from the BRG. The BRG included both Aboriginal and non-Aboriginal members, but seems to have always included more of the latter. The BRG provided a shared space, but it was important that the ex-residents had their own way of coming together to make decisions apart from the BRG. Another reason for the delay was the need to negotiate an appropriate way to acknowledge the stories of people from other countries – APY (Anangu Pitjantjatjara Yankunytjatjara) lands and Ngarrindjeri country – on Kaurna land. The Colebrook Home was first established in 1924 in Oodnadatta, a small town in central South Australia. It was run by the United Aborigines Mission, a non-denominational, Protestant Christian organisation. The home moved 350 kilometres south to Quorn in the Flinders Ranges in 1927, and then, in 1942, a further 400 kilometres to Eden Hills on the outskirts of Adelaide. At a time when few Aboriginal people had access to a car, these huge distances meant family connections were severed, often irreparably. Indeed, the purpose of physically distancing Colebrook from Oodnadatta was to separate children from the influence of their families. The children were also expected to speak only English. Towards the end of the 1960s, the number of children at Colebrook diminished and the group moved to a smaller nearby residence before the Home finally closed in 1972. In 1974, the house was demolished. So, at the time of this first public event in 1997, the Home had been gone for over 20 years, and most residents had not returned in that time. The installation of the plaque was therefore not a simple event; it required people to come back to a site that for many of them was associated with complex emotions and trauma. A barbeque was planned as a reunion event for a few hundred ex-residents, and the local community was also invited. Around 2000 people arrived, including television reporters. As an experienced public speaker, Lowitja O’Donoghue made the most of the publicity by making the connection between Colebrook and Bringing Them Home; she demanded a formal Australian Government apology for the Stolen Generations. The local Mayor, Yvonne Caddy, offered a formal apology on behalf of the Council. These two events – the installation of the memorial plaque and the apologies – were probably the first public acts of symbolic reparation offered to the Stolen Generations. Two major sculptures are now part of the memory space, both of them created by local artist Silvio Apponyi. Done in the years immediately following Bringing Them Home, the sculptures commemorate the experience of those left behind, rather than the children who grew up at the site. ‘The Fountain of Tears’ (1998) has four faces carved into the rock base. Water bubbles up onto an empty coolamon, a traditional bowl-like tool often used to carry babies, and runs down over faces, before collecting in a small pond at the bottom. 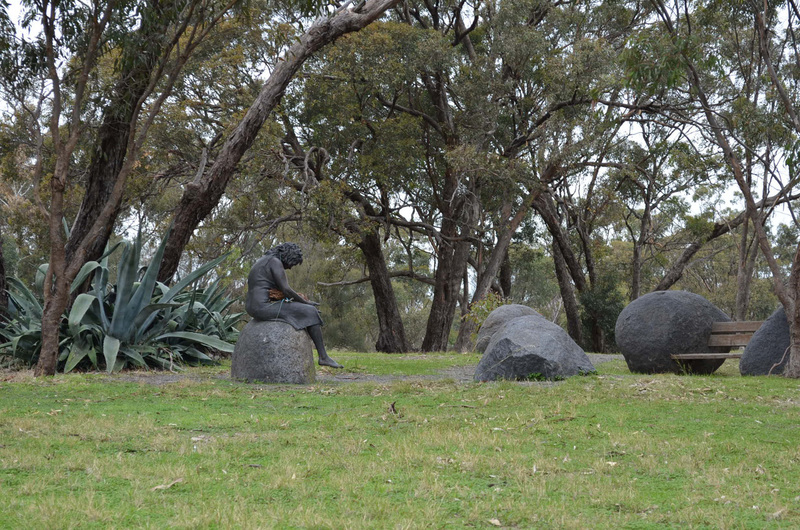 ‘The Weeping Mother’ (1999) is a bronze figure of an Aboriginal woman. She represents all the mothers of the children who were taken to Colebrook. Although the woman leans over, staring down at her empty hands, she is rarely found without something in those hands, as people bring flowers or other tokens as a mark of respect. Around these sculptures has grown up a small grove of trees, where the natural bush has partly re-grown. Pathways are punctuated by large boulders and two simple seats. There are also a number of plaques on rocks around the pathways the that crisscross the park. These plaques contain statements and poems written by ex-residents. One of the plaques honours two women who were in charge of the Home in the early days, and also shows some of the ex-residents as children. Writing in her memoir, Kick the Tin, Doris Kartinyeri says they are ‘just like the pictures in my house’, photos of her brothers and sisters from the Home. 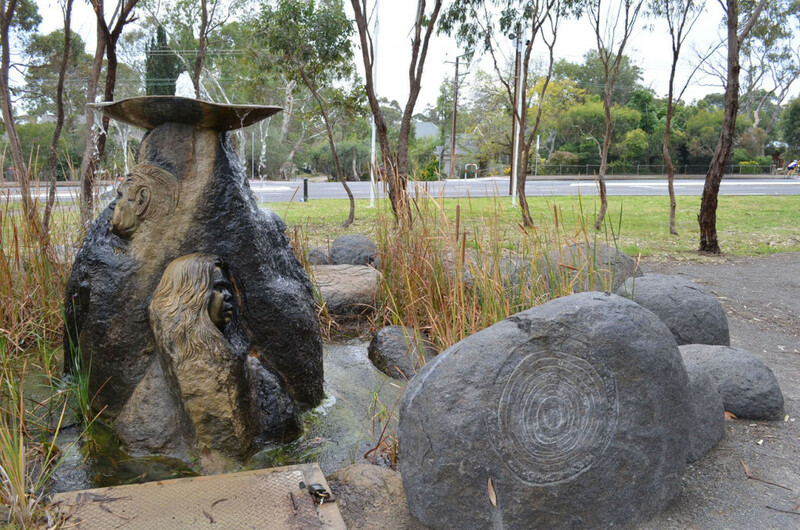 For commuters driving through the surburb of Eden Hills, the most visible part of the Reconciliation Park would be the mural painted by Kunyi McInerny in the mid-2000s. The mural tells the story of Colebrook, truthfully but also with a sense of hope. One panel on the far left reads, ‘We cannot forget the past, but we can come together and unite as one, in friendship and forgiveness, and honouring each other’s culture’. An important part of the development of the Reconciliation Park has been reclaiming this space as a positive place for ex-residents and the community. Many residents of Colebrook suffered abuse and neglect, on top of the pain of being removed from their families and communities. Reclaiming the space has allowed them to return and to remember the bad but also the good times they shared growing up. 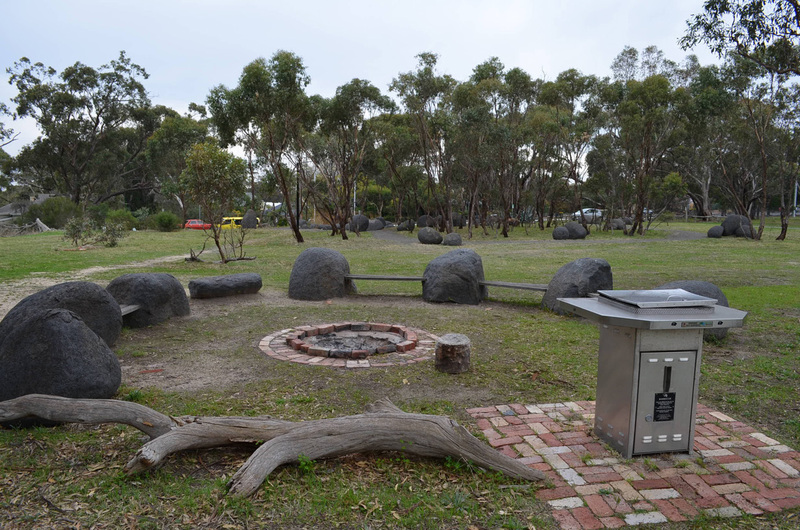 A short distance away from the memorial space is a fire pit surrounded by rocks and wooden seats to form a story circle. The Blackwood Reconciliation Group still meets here in good weather, and students are regularly brought to hear the stories, passing on the history to another generation. In 2014, local high school students completed an art project to decorate the three-sided shed, which can be used for shelter. Colebrook is not one single memorial, but many memorials, just like the stories of the Stolen Generations are not one story. As we mark 20 years of this story being told and accepted publicly, the focus has shifted, from acknowledgement and mourning, to advocacy and education for future generations. * Alison Atkinson-Phillips is a social and cultural historian from Perth, Western Australia. She works as a casual academic for Murdoch University and the University of Western Australia. 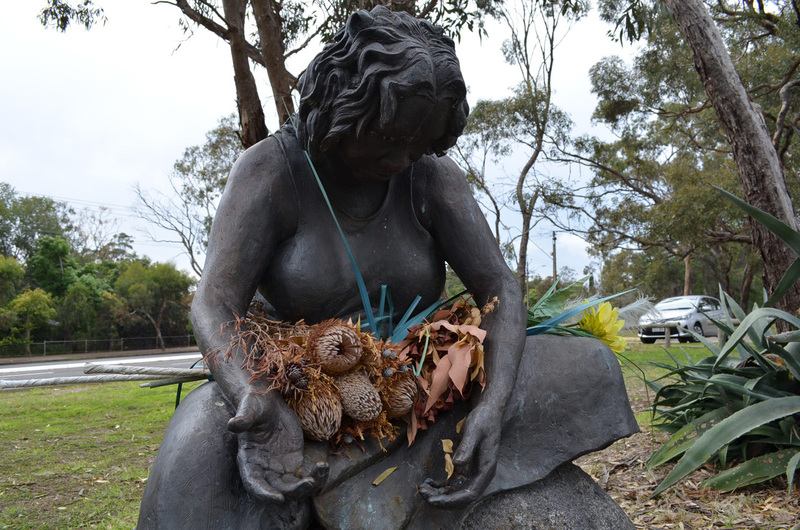 This article comes out of research undertaken as part of her PhD project, ‘Reasons to Remember: Australian Public Memorials to Lived Experiences, 1985–2015’. See: www.notacelebration.blogspot.com. Contact details for the Colebrook Tji Tji Tjuta and the Blackwood Reconciliation Group are available from the Mitcham Council website. All photographs in this article were taken by the author. HREOC, Bringing Them Home: Report of the National Inquiry into the Separation of Aboriginal Children from their Families, Canberra, 1997, p. 15. HREOC, Bringing Them Home, p. 15. Doris Kartinyeri, Kick the Tin, Spinifex Press, North Melbourne, 2000 .